work with others to complete a task. Warm-up: Divide students up into small groups of three or four. Have them use the materials provided to build a free-standing structure that is as tall as possible. You have two minutes to brainstorm with the people in your groups and four minutes to build the structure. Debrief the problem-solving activity with the students. What worked and what didn’t? How did working together help you build the tallest structure possible? Show students The Cheyenne and share with them key points from the About the Art section about the problem-solving Remington engaged in with the foundry. 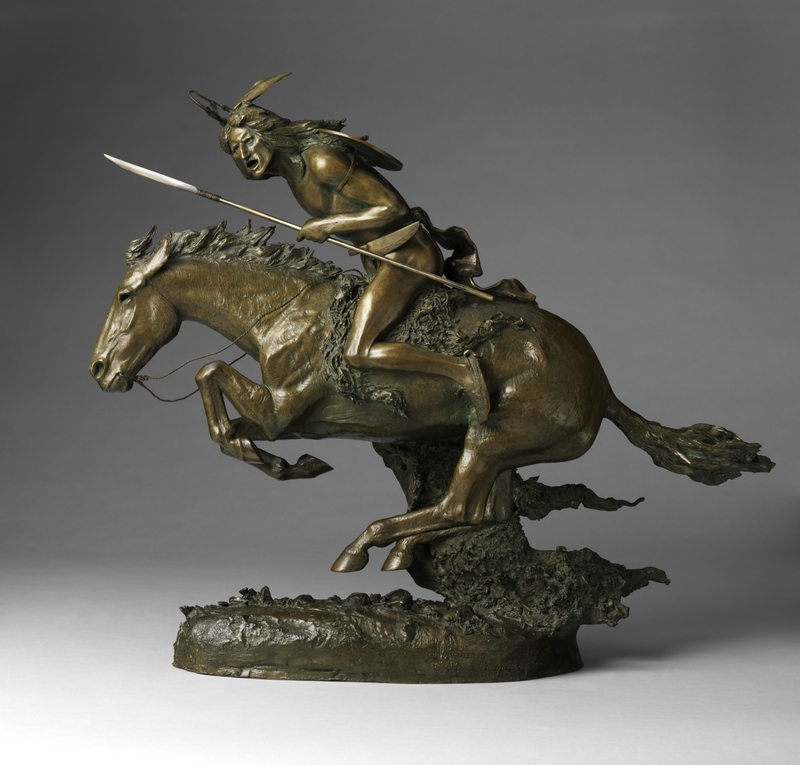 Define “airborne” and discuss the challenge Remington faced in making his airborne horse sculpture. Remington cleverly used a cape to balance the weight of his sculpture. Brainstorm other objects he could have used instead. Have students compare their problem solving strategies from the warm-up to Remington’s process. Tell students that they are going to make their sculpture of an airborne animal. Allow students to work with a partner. Have them start by looking through books and/or magazines to choose an airborne animal. Have them decide on a support, just as Remington chose to include a cape on The Cheyenne. Give them a choice of recycled materials, some Model Magic (or other sculpting product). The sculpture will be more abstract and less detailed than The Cheyenne but the primary goal is for them to take the problem of having to make a sculpture from recycled materials and to make their animal appear to be airborne. Debrief the experience. First compare the similarities and differences of their process to Remington’s. What limitations did they have? An assortment of recycled materials, including bottles, food containers, etc. Students will examine Rabbit Hunt and apply a summarization technique commonly used in reading to analyze and learn about the painting. Working in small groups, students will find as many details as possible in Blumenschein’s Mountain Lake (Eagle Nest) using specific words to guide their investigation. They will then select three of their favorite details and write a poem that incorporates all three items.